Based upon feedback from faculty and staff members, the furniture in Trotter 201 quickly transform the space from a computer classroom to a traditional discussion environment in moments. The monitors in each workstation are attached to articulating arms that easily glide below the desk surface, removing the monitor as a distraction during more discussion based portions of a class. When it’s time to return to the computer, students can simply bring the monitors back above the desk and resume working where they left off. 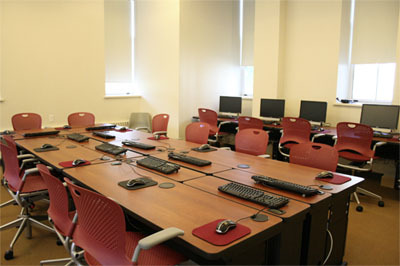 In addition to having all of the functionality of the student workstations, the instructor workstation houses the room’s A/V equipment, including the projection control panel. The furniture in Trotter 201 has been organized to allow the instructor and students to walk easily throughout the space while still having access to 22 student workstations. This freedom of movement enhances student/faculty interaction. The current arrangement creates a space that is not only comfortable and collaborative, but one that also enhances the disability accessibility of the room and its features. The workstations in Trotter 201 are Dell desktop systems running Windows 7. To schedule the room for a single class or training event, use the College’s space reservation system. Faculty who would like to use Trotter 201 (or the 30 seat Mac classroom, McCabe 306) as the sole classroom for a course or lab session should request the room as part of the regular scheduling process run by the Registrar’s Office.